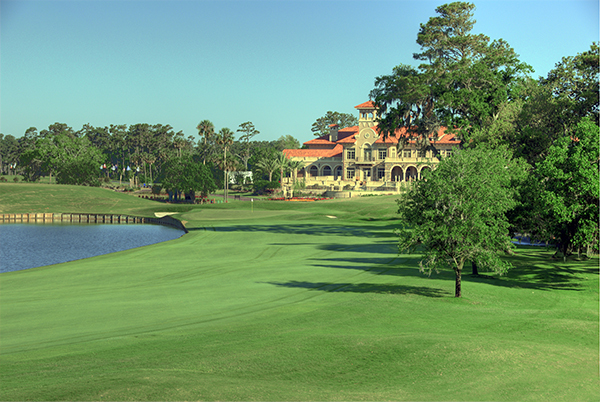 Deane Beman was the first Hall of Famer to swat a ball at what was to become the Stadium Course at TPC Sawgrass in Ponte Vedra Beach, just south of Jacksonville. On February 12th 1978, the then-PGA Tour commissioner hit a ceremonial drive into 415 acres of wooded wetlands and swamps, filled with creatures both snuffling and slithering. It was part ceremonial, part celebratory--the Tour had just purchased the morass for a single dollar bill. In the ensuing decades, practically every contemporary Hall of Fame member and modern golf star has followed Beman onto the property. This puts the Stadium Course on an extremely short list of public access facilities, in company with the Old Course at St. Andrews and Pebble Beach. Pete Dye was given two directives at project’s inception. The course name was derived from the fact that Beman and the Tour brass wanted large, spectator-friendly mounding throughout the facility, so that golf fans would have numerous vantage points from which to watch the game’s best battle for the tournament title. And, according to upper management, the Stadium Course was to be “the most democratic course in the world,” testing all aspects of one’s game. It was to have short and long par-3s and par-4s, reachable and unreachable par-5s, holes bending both left and right, and no two consecutive holes heading in the same direction, so that a prevailing wind would always make holes play differently. “Democratic” might have been the idea. “Demonic” was the end result. How tough was Pete Dye’s initial effort? The Tournament Players Championship was first conducted on the grounds in 1982, and featured names like Nicklaus, Palmer, Trevino, Miller, Wadkins and Sutton--35 Majors won among them. They all missed the cut. The pros’ initial reaction was pure outrage mixed with sarcasm. “I’ve never been very good at stopping a 5-iron on the hood of a car,” said Jack Nicklaus. “Where are the windmills and the animals,” questioned Fuzzy Zoeller. “It’s 90 percent horse manure and 10 percent luck,” offered J.C. Snead. At the insistence of the disgruntled Tour elite, Pete Dye quickly smoothed, widened, buffed, and softened some of the Stadium Course’s rough edges. Leveled with so much criticism, he also leveled the heavily contoured greens. 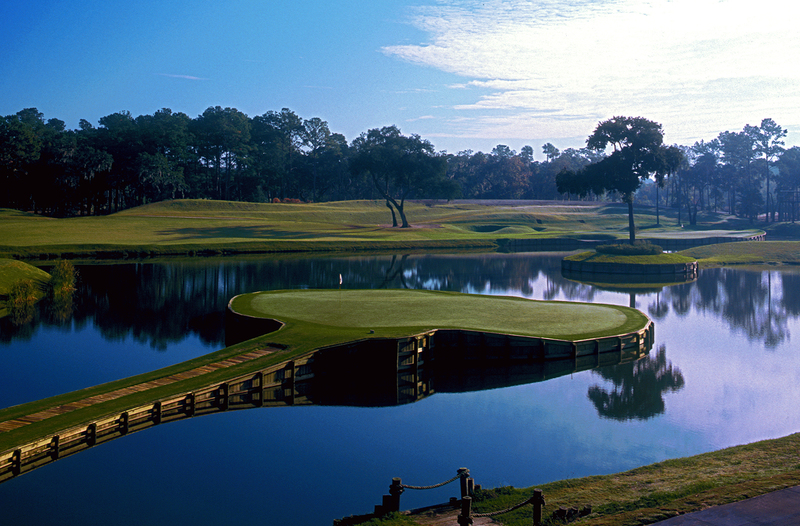 Over time, the course became more popular with the pros convening annually for what is now known as the Players Championship. This so-called “Fifth Major” attracts the strongest field of the year, with nearly all of the world’s top echelon in attendance. So while the Stadium Course has an incredible legacy, it’s the layout itself that keeps the tee sheet filled in perpetuity, and the course firmly ensconced in the worldwide top 100. It has always been phenomenally trendy with the pay-to-play crowd, eager to calm their butterflies as they try to hold onto the short iron, then hold the island green 17th. Keep it on terra firma all the way down the final fairway. Resort guests and vacationers enjoy this 18-hole thrill ride from opening tee shot to final putt. And a large part of the appeal, from the get-go, is that sink-or-swim little tee shot near round’s end, lurking in every player’s mind. It should be noted that Alice Dye, co-architect on so many of her husband’s legendary creations, was the impetus behind his single most notorious construction. 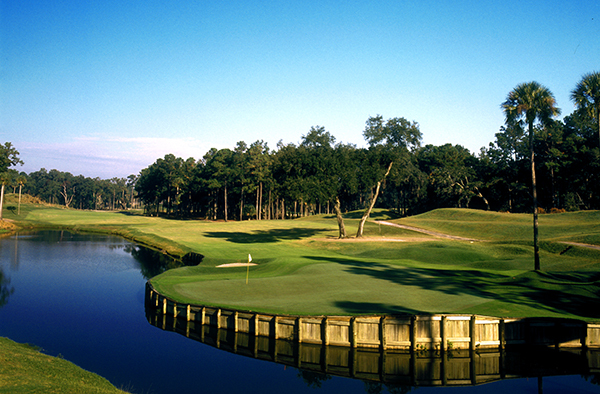 The island-green 17th was originally planned as a simple par-3 with a small adjacent lake. But the fine quality of sand next to the green site kept the crew digging, using the fill on other fairways. The sand-cavity was eventually so deep and wide that the Dyes, in tandem, decided to go for broke and completely encircle the green with water. Pete Dye was called in to make some significant changes in 2006, the impetus for the alteration being drainage. The PGA Tour noted that during the Players Championship, the course played five shots harder during dry years than soggy ones. Water, wastelands, and ungainly mounding may abound, but when the fairways are sodden it’s still a dartboard for the game’s best. So during an eight-month, 60-million-dollar renovation, the fairways were scalped and a six-inch layer of fresh sand, the equivalent of 16 football fields per fairway, was installed beneath the grass, the better to percolate and dry quickly after downpours. Now it’s a firmer, faster golf course, where off-line shots bound more quickly toward thick rough, uneven lies, encroaching water, and other unpleasantness. A new irrigation system was also installed, greenside bunkers were deepened, and 120 supplemental yards were judiciously added to the course, to bring back the same shot values that existed back in the early 1980s. The par-3 eighth hole was a long iron back in the day, but as equipment and fitness levels improved, it became a mid-iron. Now, at an expanded 230-plus yards, it’s a long iron or hybrid club once again. 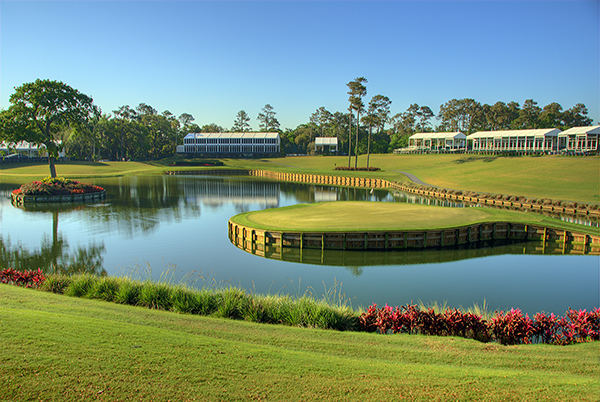 The watery 18th, daunting to begin with, is now a gargantuan 480-yard finisher. When the course reopened after the 2006 renovation, forecaddies became mandatory. And the real deal, walking caddies, also became available for the first time. This much-welcomed addition now means that a resort guest not only can play this much-admired Tour venue, but can enjoy the walking experience in the same manner the Tour pros do. But posting scores like the Tour elite? Sorry, two out of three will have to do.